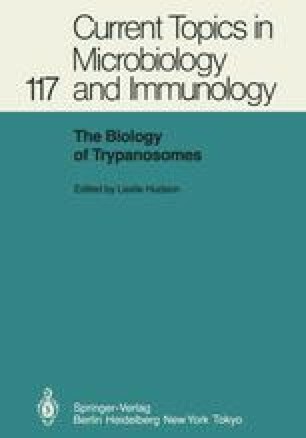 Antigenic variation in the African trypanosome is a consequence of changes in the composition of the surface coat which covers the entire surface of the trypanosome, when it is in the blood stream of its mammalian host (reviewed by Vickerman and Barry 1982). The surface coat is made up of a matrix of about 107 identical glycoprotein molecules which are known as the variant surface glycoproteins (VSGs), because each antigenically distinct variant can be characterised by the immunochemical profile of the VSG which is expressed at its surface. Much is known about the biochemistry of the VSGs, which are notable for the remarkable diversity within their amino acid sequences (reviewed in Turner 1982 a; Cross 1984). However, it is clear that all VSGs must have certain features in common. Thus, they must all be capable of forming a compact surface coat, about 12- to 15-mm thick (Vickerman 1969), be impermeable to soluble mediators of the immune system, such as antibody and complement, and be anchored firmly to the plasma membrane. Furthermore, all the VSGs are presumably produced through a common intracellular pathway, utilising the same biosynthetic machinery. Thus it is to be expected that this combination of structural demands and synthetic restraints will be reflected in conserved structural elements, and interference with the synthesis of such elements should therefore be a potent form of chemotherapy. It is the purpose of this review to discuss what is known about the biosynthesis of VSGs, and also to review our knowledge of one of the most intriguing features of VSG biochemistry, namely the unusual mode of attachment to, and ready release from, the plasma membrane.